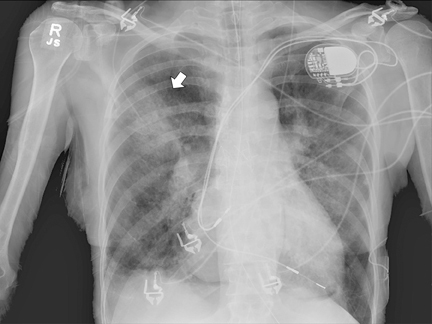 An 84-year–old woman presented with hemoptysis during an elective right-heart catheterization when a pulmonary capillary wedge pressure measurement was performed. Her history was significant for hypertension, atrial fibrillation, pulmonary hypertension, and atrial septal defect repaired 40 years prior. She presented with diffuse expiratory wheezing and was admitted to the ICU and intubated. Bronchoscopy was performed and showed blood clots in the right mainstem bronchus, but there was no active bleeding. A chest radiograph at ICU admission revealed a right upper-lobe ill-defined airspace opacity (Figure 1). On day 2 of admission, the patient was extubated and transferred to a medical floor. 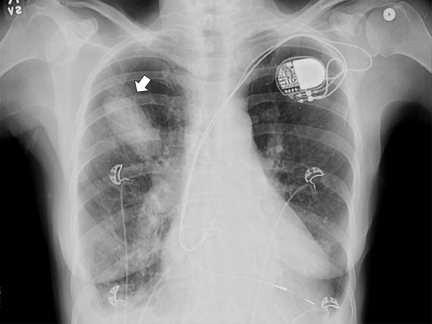 She developed a cough and a repeat CXR was performed, which showed persistence of the right upper lobe (RUL) opacity, which was further studied with a computed tomography angiography (CTA) scan. The patient declined any intervention and is being followed clinically. 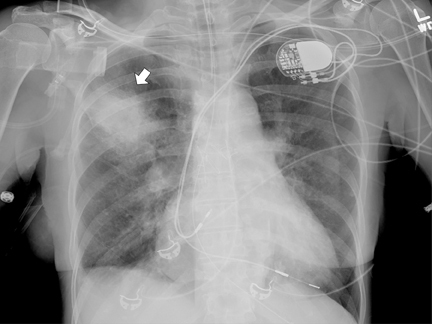 Upon admission to the ICU, after catheterization, a chest radiograph showed a RUL opacity. A repeat chest radiograph on day 2 in the hospital showed further increase in density of the RUL airspace opacity (Figure 2). Subsequent follow-up imaging studies at days 3 and 9 after catheterization showed the RUL opacity to develop into a well-marginated ovoid opacity (Figures 3 and 4). CTA showed a large, ovoid, enhancing mass with crescent-shaped low attenuation in the RUL and with extensive surrounding ground-glass opacity compatible with a large partially thrombosed pseudoaneurysm with peripheral hemorrhage (Figure 5). 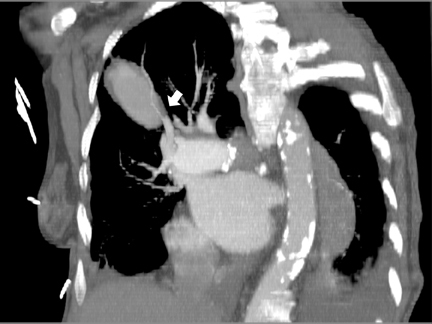 Axial and oblique coronal MPR reformations of the contrast-enhanced CT revealed the RUL mass to be tubular in shape arising adjacent to a right hilar-pulmonary vessel (Figure 6 and 7). In 1985, 500,000 right-heart catheters were placed in the United States, and approximately 1 million were used worldwide.1 During the last 2 decades, the trend indicates that pulmonary artery (PA) catheterization use decreased by 65% from 5.66 to 1.99 per 1000 medical admissions in the U.S.,2 probably due to growing evidence that this invasive procedure does not reduce mortality, but increases the chances of transient arrhythmias, catheter-related sepsis, and pulmonary-artery injury.3,4 Rarely, injuries to the pulmonary arteries lead to vessel rupture with focal bleeding into the surrounding lung parenchyma that may be limited by thrombus formation, extravascular tissue compression, or both, leading to the formation of a pseudoaneurysm. Pulmonary angiography is the historical reference test providing accurate assessment of size and anatomical localization.6 Pulmonary artery pseudoaneurysms are seen as an extravascular collection of contrast material in continuity with a branch of the pulmonary artery. One of the benefits of the procedure is that it allows simultaneous transcatheter embolization. When conventional or CT pulmonary angiography cannot be performed, magnetic resonance angiography (MRA) becomes a valuable option. T1-weighted images adequately demonstrate the pseudoaneurysms. Fast spin echo (FSE) and gradient echo imaging are useful in the morphologic evaluation of pulmonary vasculature from main trunk to subsegmental branches.16 When possible, gadolinium-enhanced MRA improves the evaluation of subsegmental arterial branches. In the acute setting of aneurysm rupture, immediate management comprises lateral decubitus positioning, intubation with a double-lumen endotracheal tube, and ventilation with positive end-expiratory pressure. Occasionally, IPAP perforation due to Swan-Ganz catheter can occur during cardiac surgery, in these cases parenchymal resection and pulmonary artery repair is crucial.20 It is the larger pseudoaneurysms that have the higher risk of rupture making surgery hazardous. Pulmonary resection or lobectomy can be considered for severe cases in which previous nonsurgical treatment attempts failed, but it confers high mortality as well. Swan-Ganz catheterization, which provides very important hemodynamic information, is a very useful invasive procedure in evaluating and managing critically ill patients. Prompt recognition of its complications, in particular iatrogenic pulmonary artery rupture, is mandatory due to its high morbidity and mortality. Understanding the imaging manifestations is critical. When chest radiographs are unremarkable and the clinical suspicion is present, further imaging with a contrast-enhanced multidetector CT scan or pulmonary angiography is recommended. Percutaneous-catheter coil embolization is the typical first-line management, as it relatively quickly and safely treats the injury with stable long-term results. Robin ED. Overuse and abuse of Swan-Ganz catheters. Int J Clin Monit Comput. 1987;4:5-9. Wiener RS, Welch HG. Trends in the use of the pulmonary artery catheter in the United States, 1993-2004. JAMA. 2007; 298:423-429. Rubenfeld, GD, McNamara-Aslin E, Rubinson L. The pulmonary artery catheter, 1967-2007: Rest in peace? JAMA. 2007;298:458-461. Slung HB, Scher KS. Complications of the Swan-Ganz catheter. World J Surg. 1984;8:76-81. Boyd KD, Thomas SJ, Gold J, et al. A prospective study of complications of pulmonary artery catheterizations in 500 consecutive patients. Chest. 1983;84:245-249. Poplausky MR, Rozenblit G, Rundback JH, Swan-Ganz. Catheter-induced pulmonary artery pseudoaneurysm formation: Three case reports and a review of the literature. Chest. 2001;120:2105-2111. Kearney TJ, Shabot MM. 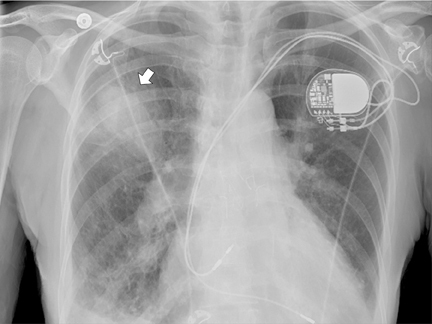 Pulmonary artery rupture associated with the Swan-Ganz catheter. Chest. 1995;108:1349-1352. Ferretti GR, Thony F, Link KM, et al., False aneurysm of the pulmonary artery induced by a Swan-Ganz catheter: Clinical presentation and radiologic management. AJR Am J Roentgenol. 1996;167:941-945. Sam A, Sandur S. An iatrogenic lung nodule. Chest 2009;136:314-317. Abreu AR, Campos MA, Krieger BP. Pulmonary artery rupture induced by a pulmonary artery catheter: A case report and review of the literature. J Intensive Care Med. 2004;19:291-296. Dieden JD, Friloux LA, 3rd, and JW Renner. Pulmonary artery false aneurysms secondary to Swan-Ganz pulmonary artery catheters. AJR Am J Roentgenol. 1987;149:901-906. Burrel M, Real MI, Barrufet M, et al. Pulmonary artery pseudoaneurysm after Swan-Ganz catheter placement: Embolization with vascular plugs. J Vasc Interv Radiol. 2010;21:577-581. Castaner E, Gallardo X, Rimola J, et al. Congenital and acquired pulmonary artery anomalies in the adult: Radiologic overview. Radiographics. 2006;26:349-371. Nguyen ET, Silva CI, Seely JM, et al. Pulmonary artery aneurysms and pseudoaneurysms in adults: Findings at CT and radiography. AJR Am J Roentgenol. 2007;188:W126-134. Guttentag AR, Shepard JA, McLoud TC. 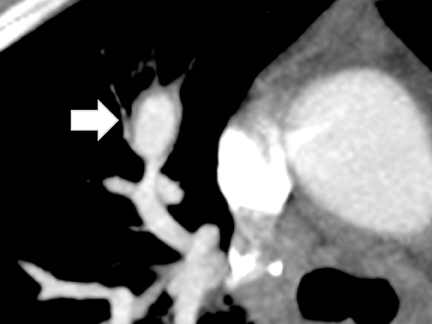 Catheter-induced pulmonary artery pseudoaneurysm: The halo sign on CT. AJR Am J Roentgenol. 1992;158:637-639. Ugolini P, Mousseaux E, Sadou Y, et al. Idiopathic dilatation of the pulmonary artery: Report of four cases. Magn Reson Imaging. 1999;17:933-937. DeLima LG, Wynands JE, Bourke ME, et al. Catheter-induced pulmonary artery false aneurysm and rupture: Case report and review. J Cardiothorac Vasc Anesth. 1994;8:70-75. You CK, Whatley GS. Catheter-induced pulmonary artery pseudoaneurysm: a case of complete resolution without intervention. Can J Surg. 1994;37:420-424. Rouquier J, Arrivé L, Masini JP, et al. Spontaneous resolution of asymptomatic false aneurysm of the pulmonary artery induced by Swan-Ganz catheter. J Radiol. 2001;82:1732-1734. Choh JH, Khazei AH, Ihm HJ, et al. Catheter induced pulmonary arterial perforation during open heart surgery. J Cardiovasc Surg (Torino). 1994;35:61-64. Karak P, Dimick R, Hamrick KM, et al. Immediate transcatheter embolization of Swan-Ganz catheter-induced pulmonary artery pseudoaneurysm. Chest. 1997;111:1450-1452. 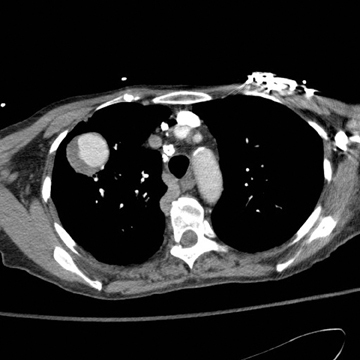 Iatrogenic pulmonary artery pseudoaneurysm. Appl Radiol.